These lovely, lightweight scarves will make you think the fairies have woven them. 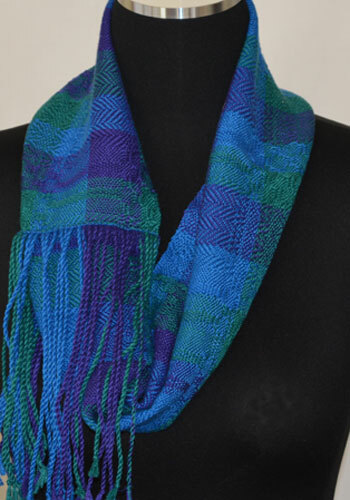 When you weave the scarves, you will transform 10/2 cotton yarn into 2 fabulous scarves. Each scarf is approximately 8″x 72″. Four colorways to choose from. Listen to the Loon! Difficulty level for this kit is Intermediate to Advanced (Two fish). This is a Four to Eight harness kit. This scarf pattern plays with a combination of block weaves and color changes. Colors and blocks change at different points, and this shift increases the visual complexity of the hand woven fabrics! The 8 harness version uses twill blocks, and the 4 harness version uses twill combinations. Both the 4 and 8 harness patterns are equally beautiful. Try them both sometime! This scarf has a great feel to it because we sett the 10/2 mercerized cotton at 20 epi. This allows the yarns to stay soft and supple in the finished product. If you add beads to the fringe as you ply them, these scarves become truly dazzling. We owe a deep debt of gratitude to two of our honorary lunatics, Paula Heller and Mary Berent, who helped make these scarves a reality! Just completed this scarf in the 8 shaft version and the Twilight colorway. It was very fun, and the finished scarf is a real eye catcher. Everyone who sees it comments how beautiful it is. Now I’ll have to try the 4 shaft version. The interplay of pattern and color is almost mesmerizing. Hey there!, I found this information on Lunatic Fringe Yarns for you: "Bedazzling Scarf Kit". Here is the website link: https://lunaticfringeyarns.com/product/bedazzling-scarf-kit/. Thank you.